Create a simple table that I can send updates to so I can check the size. To better check the growth rate of a database I created a simple python program to insert data into it. textString = "this is the text string for the database test "
Here is a very detailed query that will list all the tables and their sizes listing the largest one at the top. Finally here is a command to use on the linux command line to get the size. 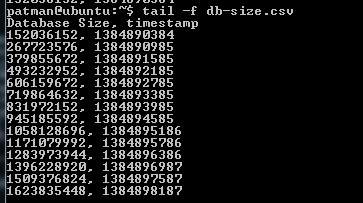 > psql -d testdb -U patman --pset=format=unaligned -c "SELECT pg_size_pretty(pg_database_size('testdb'));"
Using this command I created a little bash script to monitor the size increase of a database. It runs a check every 10 minutes and puts the data in a csv friendly format. Simply pipe it out to a csv file.